The One Centimetre Receiver Array (OCRA) project aims to construct a one hundred beam receiver system, operating in a frequency band centred on 30 GHz (Browne et al. 2000, Proc. SPIE, 4015). This system would be installed on the 32m parabolic antenna at Torun Observatory in Poland - an antenna that is ideal for high frequency multi-beam work as it has very accurate reflector panels and has paraboloid/hyperboloid (non-shaped) optics. Having 100 beams would allow all-sky surveys to be carried out much quicker than is currently possible. A large scale survey, of point sources at 30 GHz, would prove especially useful for future projects such as the LFI (Low Frequency Instrument) which is part of ESA's Planck satellite. Currently we are working on two projects, designated OCRA-p and OCRA-F, that are being used to develop the technology needed for the full OCRA system. 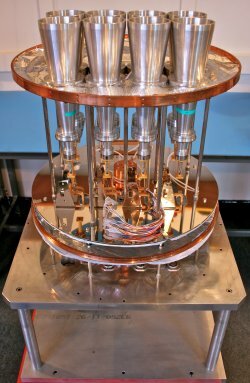 OCRA-p is a two-beam prototype receiver, based on the design for the 30 GHz Planck LFI radiometer. OCRA-F is an 8 beam receiver using MMICs. The OCRA-p radiometer is based on the design for the prototype demonstrator radiometer for the Planck Low Frequency Instrument. It is a two-beam pseudo-correlator receiver, and is similar to the WMAP 23 GHz receiver. This radiometer was produced to test concepts and develop hardware and software measurement techniques for Jodrell Bank Observatory's front-end module (FEM) programme. The receiver works by combining the two beams using a hybrid, with combinations of the signals passed through two Low Noise Amplifiers (LNAs) and a pair of phase switches. The signals are then separated by another hybrid, futher amplified and square-law detected. The detected signals are subtracted from each other to get the difference in signal between the two beams. This reduces the effect of 1/f noise from the LNAs and the atmosphere. OCRA-p was constructed during 2001-2002 at Jodrell Bank Observatory. It has undergone many tests both in the laboratory and on the telescope to ensure that it meets its initial design specifications. The first observing campaign started during the winter of 2003/2004, and observations have been ongoing since. The commissioning and first observations were described in Stuart Lowe's PhD thesis in 2006, on "The One Centimeter Receiver Array Prototype - Evaluation, Operation and future steps". The OCRA FARADAY (OCRA-F) instrument is an 8-beam 30 GHz receiver, and is the second phase of the OCRA programme. It was designed and constructed as part of the EC-funded FARADAY project within the RadioNet consortium. The design of the instrument is based on OCRA-p, and marks the transition of the programme both from a single receiver module with a pair of horns to multiple receiver modules, and also from traditional components to integrated modules. The increase in the number of receivers greatly improves the survey ability of OCRA, both due to the increase in the number of receivers (and hence effective integration time), or alternatively an increased instantaneous field of view. 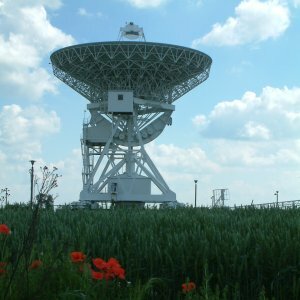 OCRA-F was mounted on the Torun telescope in December 2009. Its assembly, testing and initial commissioning was described in Mike Peel's PhD thesis in 2009, on "Simulations and Observations of the Microwave Universe". OCRA-F will be used to do small scale blind surveys for point sources and the Sunyaev-Zel'dovich effect, and will also be able to create maps of extended emission. Kettle, Roddis and Sloan (2005a), "A lattice matched InP chip set for a Ka band radiometer", 2005 IEEE MTT-S International Microwave Symposium Digest, 12-17 June 2005. Kettle, D. and N. Roddis (2007), "A Ten-Beam Ka-Band Radiometric Receiver Using Custom Designed InP MMICs at Cryogenic Temperatures", IEEE Transactions on Microwave Theory and Techniques 12, pp.2700-2708. 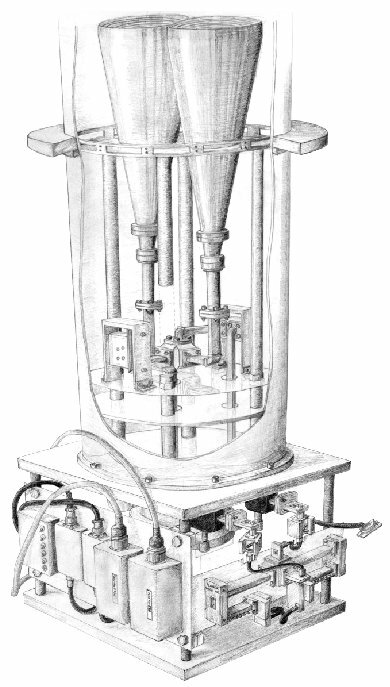 Kettle, D. and N. Roddis (2007), "Cryogenic Performance of a Very Low Noise MMIC Ka-Band Radiometer Front-End", IEEE/MTT-S International Microwave Symposium, 2007, 2087-2090.